then we can write the ending. It was 6:00 p.m. Isla Mujeres, Mexico time, on Sunday, March 8, 2015— International Women’s Day. It was the closing ceremony for the We Move Forward women’s conference held that weekend at the MIA Reef Hotel. Moving around the circle, “I feel blessed” and “I am grateful” were the phrases spoken most often. Insights were shared and commitments made to move forward with the intention of creating our best possible lives. There were tears and laughter, touches and hugs—as there had been the entire three days. We Move Forward was founded by Janeen Halliwell, who believes “We are all ordinary women that are capable of doing extraordinary things. Taking time to get clear on our desired future brings us closer to experiencing it. Believe in yourself and pay attention to those who believe in you too.” Janeen created WMF to bring kind-hearted, like-minded women together in a supportive, affirming community—where there is the time to focus on their deepest desires—and where tools are shared that can empower them to create healthy, happy, authentic lives. I arrived at WMF feeling emotionally and physically battered and bruised—from my work, from the brutal Chicago winter, and from my previous three months of doctors’ visits and surgeries. I had great hopes for the conference: To meet lovely people, to gain valuable insights, to rest and heal. I was not disappointed. I believe in divine timing and know it played a part in my journey to We Move Forward. The initial conference was in March 2012, but I first became aware of it in 2013. My husband and I were vacationing on the Mayan Riviera that February and I knew WMF was going to be held in nearby Isla Mujeres soon after we left. I felt a pull—and I imagined staying on in Mexico and crashing the conference! Fall of 2014, I felt the pull, again. I went to the WMF website so often that the music stayed on my mind. I studied pictures and read about the speakers and Janeen’s mission. In October, I entered a WIN Wednesday book giveaway and on October 14th Janeen messaged me that I’d won! I wrote her of my interest in attending WMF and got her address so I could gift her with a copy of East of Mecca. 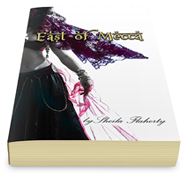 On January 14, 2015, East of Mecca was featured for Win Wednesday! By early December, I knew I had to attend the 2015 conference. But then there was the funky mammogram and biopsy. Monday, December 8th, I got the (false) “all clear.” I’d been following airline prices to Cancun and December 10th they dropped to an all-time low. I purchased them and registered for WMF that day. It was a good thing I didn’t know of the roller coaster I was already riding—that I would have a lumpectomy on January 28, receive a cancer diagnosis, and have a second surgery February 12. For the second surgery, my primary concern was scheduling around WMF. “I’m going to Mexico the first weekend in March,” I announced, more than once. “I either have the surgery well before or schedule it for afterwards.” There was no debating—no considering NOT going. I had wanted to attend WMF so long before I knew how much I would need to attend, that by the time I boarded the plane for Cancun, Thursday March 5th, the wanting had turned into an urgency—a physical and emotional longing. Like the instinct driving a homing pigeon in flight. My flight was smooth, and walking through the doors of the Cancun airport I was greeted with welcoming Mexican heat and entrepreneurs selling tours, cold beer, and icy margaritas. It was a festive atmosphere. My transportation was pre-arranged through WMF, and I was happy to see my name on a placard. By the time I was on the ferry from Cancun—crossing the exquisite, clear, turquoise water to Isla Mujeres—all my senses were awakened. There were blue skies and soft, salt-scented breezes. The sun was warm on my winter-white skin. A Mexican couple sang and played guitar. Emotions welled and soon I was crying with gratitude and happiness. I felt like I was coming home. At the MIA Reef Hotel, I checked into my room on the sixth floor, with a balcony overlooking the Caribbean. Then I immediately ran across the bridge to where a pre-registration Happy Hour Meet & Mingle was in progress. My first image of the women of WMF was at the Fenix restaurant where they were posing for a group photograph. I rushed up breathlessly, was welcomed, given my badge, and immediately gathered into the group for a picture. Immediately gathered in could well describe my overall experience at WMF—welcoming and inclusive. Some women had attended before and some of us were first-timers. Some came with friends and many came alone. We were all ages and backgrounds. Mostly, we were strangers to each other, but we already had much in common—hearts heavy with burdens both similar and different. There were recent widows and divorcees. Women struggling with their own medical issues or those of loved-ones. Those grieving private losses evidenced by distant stares and frequent tears. I felt war-torn and weary from my surgeries and the previous months’ stress. At the mixer, I met Janeen and her lovely mom, and Joyce Hamilton (who had won East of Mecca), and a number of other women—including Michelle Collier, who would become a friend I hope to see again in my life outside of WMF. That night, there was a full moon over the Caribbean. I left my drapes open and slept soundly with the ocean breeze blowing into my room. The next morning, I awakened to a beautiful sunrise. Friday, the first full day, was amazing and jam-packed. Janeen’s moving welcome address set the stage for all to come. We were encouraged to set daily intentions and listened to powerful speakers. In a breakout exercise we were randomly assigned groups where we shared personal information. I was in the pink group. There were movement breaks throughout. There were also musical interludes featuring the hysterically funny, irreverent singer/comedian, Lisa Koch. Some of her songs were moving, but most left us laughing uncontrollably. A group of us ate lunch in a local restaurant, and that night I was swept into a golf cart by a group of women for a long ride to the Bahia Tortuga Performing Art Centre to see Lisa Koch and Jeff (the WMF sound guy) perform. About fifty of us ate dinner under the stars. There was lively conversation, laughter, and many margaritas. Afterwards, a crowded taxi ride got me back to the hotel. Saturday was another full day, with fabulous speakers, music and laughter, meaningful movement. I loved it all. Again, a small group of us went out for lunch, and later there was a scavenger hunt. My pink group gave it our best shot, but we didn’t win. Dinner that night was at Fenix. In Saturday night’s journal entry, I was plotting ways to reschedule my Monday morning flight for another day. Sunday, March 8th was International Women’s Day. Our last day of WMF had arrived so quickly. Our first speaker was Almas Jiwani, President of United Nations Women Canada National Committee. She spoke eloquently on the importance of women’s empowerment, gender equality, and “The Power of One.” Following Almas was Cathy Cleary, whose inspiring stories about her work with Tchukudu women and children in the Congo had us in tears. And then Jerusha Akatzin, a Mayan priestess, performed a Mayan blessing. After a short sermon she created an altar from cloth and candles and the elements. Jerusha asked us to think of what we wanted to let go of, as well as what we need to embrace in our lives moving forward—to consider carefully when asking for these things. With belief, she said, our prayers would be answered. I asked for healing—to regain my physical and emotional health. To experience vitality that had gone missing over the past number of months. We were each blessed individually while touched with roses and greenery that had been dipped in holy water. After being anointed, I was so overcome with emotion that I had to move away, cover my face, and sob. Two separate women came forward with strong, comforting hugs. Thank you, Deanne and Merlyn. I am forever grateful. After more music and a lovely mini-massage, Michelle and I went to Fenix for lunch. We ate ceviche and shrimp, talked while live music played in the background then returned to the MIA for a global dance party on the terrace. The dancing was so much like Zumba that I felt I was home! That afternoon, I resisted two tempting workshops and chose to spend alone time on the beach. I waded deep into the clear, turquoise waters of the Caribbean, immersed myself in the warm, salty water, and imagined my healing had begun. Then I spent the next hour basking in the sun and enjoying a piña colada. From 5 to 6, there was a happy hour on the terrace. By that time, we were all attired in white for the closing ceremony. We drank wine, margaritas, or the popular “Miami Vice” made of piña colada and strawberry puree—and we toasted Janeen and the entire WMF team that had made the conference so wonderful. And then, it was time for the closing ceremony. I cannot remember exactly what I said when the basket reached me. I know at that moment I felt blessed, grateful, and aware of my miraculous journey to WMF. Moving forward I vowed to stay on my emotional and healing path—and to stay true to the promises I’d made to myself. After more hugs and tears, we celebrated at a banquet and dance party. There was abundant food and wine, conversations and laughter, and great music. The weather was sultry, but there are few things I love more than dancing. A sweat-drenched group of us danced all night, with the party ending at 11:00. It has taken me longer than usual to write this post, because describing the spiritual and emotional experience of We Move Forward has been like trying to describe the majesty of the Grand Canyon to someone who has never seen it. Neither words nor pictures can clearly convey how and why it is so life-changing. Its magic exists in what is unseen; the nurturing, validating energy of one hundred women gathered together—accepting, loving, crying, and laughing. Coming together as strangers, parting as friends. ~My final journal entry, Monday March 9th, 2015, 7:30 a.m.
Today, I move forward. 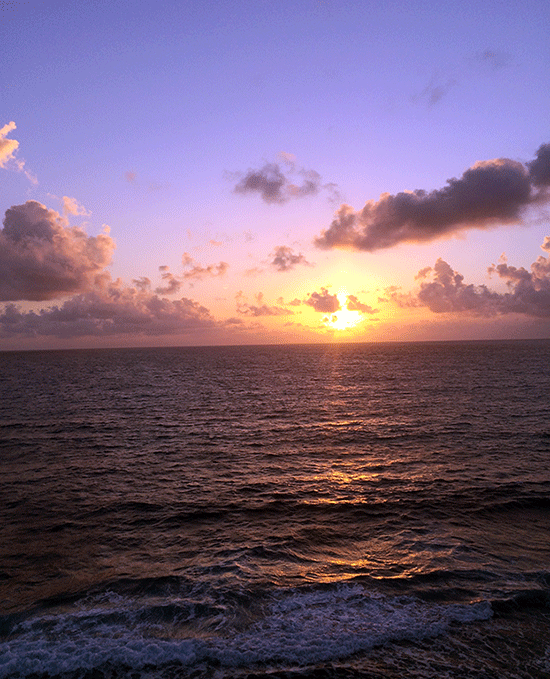 I’m sitting on my balcony on Isla Mujeres having watched the sunrise. There is a lone red and white fishing boat out on the choppy water, and waves crash on the rocks below me. The sky is blue and the sun is already warm on my face. I feel at peace and at home here. I must come back. * For more information on We Move Forward, please visit their website, www.WeMoveForward.com I encourage every woman I know to consider attending WMF2016. I promise you won’t regret it. I’ll be there! Hugs and warm wishes, Sheila. I’m enjoying reading your posts and learning more of your journey. I wish our time together in that Carribean paradise were longer but I look forward to visiting soon.